Why We Have One Tongue But Two Ears - What Is Stoicism? The following is a conservative estimate. Every day 500 million tweets are sent on Twitter, 95 million photos are uploaded to Instagram, and 55 million status updates are posted on Facebook. Add in shares, likes, comments and time spent watching video, and the numbers are dizzying. That’s a lot of virtual noise and a lot of people clamouring for attention. Amongst all that, of course, some of the material being shared is actually useful. But the same can’t always be said for the conversations that ensue. If you log on to Twitter, it won’t take you long to get lost reading a thread of endless back-and-forth argument where the participants don’t realise there can be no winner. Nor do they realise that in trying to bring their opponent round to their viewpoint they are fortifying even stauncher resistance. It would be difficult to prove in a study but surely regular engagement in futile social media debate affects a person’s attitude towards conversation in the real world. If you’re regularly feeling the need to impose your views on someone you’ve never met, perhaps you’ll start to take that tack with people you have met. This could be even more frustrating for passive observers as there’s no character limit in real life. 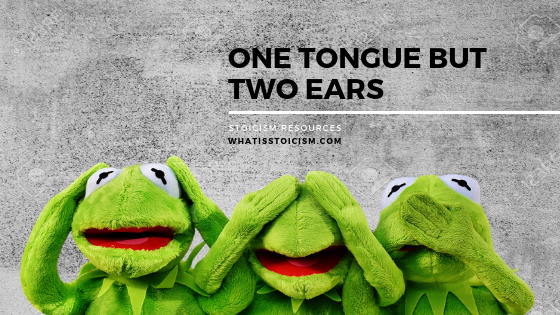 The founder of Stoicism, Zeno of Citium, is quoted as saying, “Nature gave us one tongue but two ears so that we may listen twice as much as we speak.” Maybe Nature giving us two thumbs is what has pushed things out of proportion online, but the figurative advice is still sound. Listen, absorb, consider more. Speak when we’re sure of what our intentions are – when we’re sure we’re furthering discourse in a constructive way. If we’re fortunate enough to have the ability to speak then it’s a given that we’ll take the privilege for granted. The same goes for having good eyesight and sound hearing. When we’re told to “look at this” or “listen to that”, there is no thought involved. And if we want to get involved in a conversation we can just open our mouths and blurt out whatever comes to mind. But what if some of those faculties are taken away from us? What if you lose your ability to hear or speak? Immediately you need to reconsider how to communicate effectively. It’s likely that you’ll need to use sign language and that will require a clearer focus in order to get your points across precisely. You can’t indulge in pointless rambling, and faced with a futile argument you’ll have to decide if engaging is worth the effort. When Leonardo da Vinci moved to Milan from Florence in 1482, he became acquainted with another artist, Ambrogio de Predis, whose half-brother Cristoforo was deaf and didn’t speak. Watching how Cristoforo communicated, da Vinci drew great artistic inspiration – particularly in the relation between human gestures and thoughts. By paying careful attention to the gestures of the characters in his paintings, da Vinci could convey all kinds of thoughts and emotions without the need for words. Signers also need to carefully consider their own gestures to concisely convey their thoughts when it is their turn in a conversation. The efficiency of this type of communication is evident as there is little room for ambiguity. As a signer, while someone’s attention is on you, you have to be clear and engaging in order to make the most of that time. The excess is cut out and you say only what needs to be said. It’s worth trying out some of the gestures of a sign language to appreciate what it takes to communicate in this way. Here’s a handy dictionary of gestures for British Sign Language. Those of us without hearing and speaking impairments might do well to think twice the next time we’re about to open our mouths. Not only should we be grateful for our abilities, but we should be careful that we aren’t misusing them. Or indeed just overusing them.